As a support in the bass area, compact loudspeakers often need an active subwoofer. The Heco New Phalanx 302 delivers the required basis in a quality that shows the manufacturer’s tradition. In addition, it convinces by its elegant design and the flawless manufacturing. 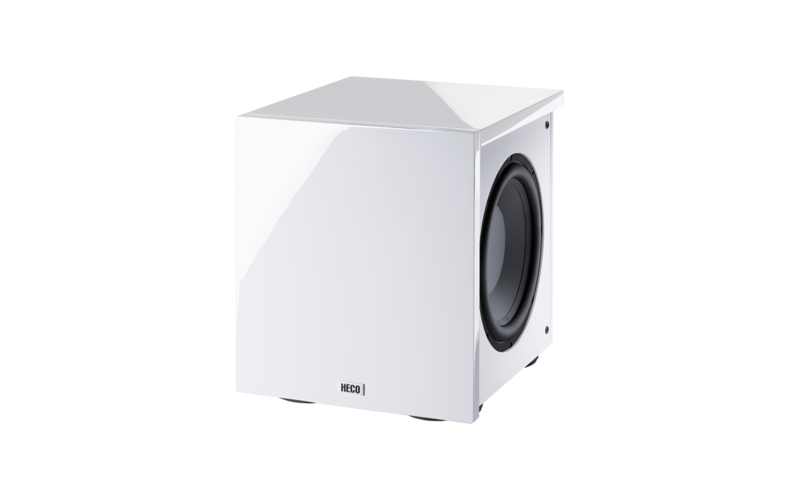 While a lot of other subwoofers are better to hide, the Heco design in high gloss white or black comes in an attractive design. The technology inside is equally attractive: the impressive 30 m bass loud speaker comes with a passive membrane of the same size which widens the frequency spectrum further in the lower segment. The speaker works down to 20 Hertz, reaching men’s hearing limit. It is run by a 350 W (max.) amplifier, thus taking this burden off the shelf speakers and helping them to reach an even more detailed re-play.